Provincial councillor K.D. 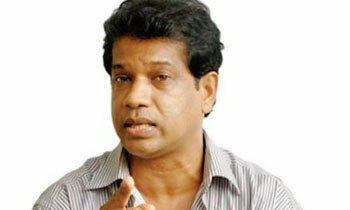 Lalkantha today urged the government to appoint a commission similar to that of the Presidential Commission of Inquiry (PCoI) on the CB bond issue to investigate Minister Rajitha Senaratne in connection with the SAITM controversy. He told a news conference that he had valid suspicions that several politicians had been paid by SAITM owner. “It is necessary to set up such a commission to probe these matters. Instead of establishing a special court to probe corruption, a special court should be set up against these ministers,” Lalkantha said. Commenting on the SAITM controversy, he said that instead of understanding the gravity of this matter, the government was attempting to make the anti-SAITM groups apply pressure on the government. Mr. Lalkantha said the ‘SAITM Virodhee Jana Pawra’ would continue its battle until they succeeded and added that the government should take the responsibility of the consequences. The 7000 students are mislead by the JVP. The TAX payer pays for student education. If they don't attend lectures and do the studies then they should finance their education. A student should be given a strict duration for free education. If they don't complete their education in the specified duration they should pay for the additional time taken to complete their education. Why should the TAX payer pay for idle time of the student? Great idea.If the student is not completing the course in due time due to political reasons, they should pay for the lost resources allocated for them. JVP is trying to come to power by misleading medical students. Just threatening. The last march from Kandy was a flop. A waste of time for use and a fishing for votes for some. This too will be the same. The JVP will never never come to power with these short sighted actions. Sri Lanka is not democratic country. These JVP and Peratugami students and ideologies are representing less than 3% of the population. The government is represented by more than 50% of the population. What is happening now is after electing a government by majority, minors come to the streets and making issues at Universities they demand many things related to their own "Gothra". How far can we tolerate these things. Suppose JVP Lalkantha says if the demands are not fulfilled they will topple the government and he is eventually threatening the people of the country similar to how they behaved during 88-89. If suppose JVP government is ruling and people demand what is against the majority who elected the JVP government what would be their solution? Will they agree to give demands? Simplest answer is NO. Then what's wrong with these people? How far we can go like this? Mr.Lal kantha, you should be more alert on treasury bond scam and how to recover poor labourers EPF,rather than going after SAITM and doctors. If GMOA whole heartedly led 'Against SAITM' issue by their own, now it could be endup with success but only warnings ,and continue to work (and private practice)made themselves jokers.Involved political parties have different agendas,Now whether like or not, whole generation of medical students have got involved in this no ending struggle .